1.15.1 How do I trigger additional talos/test runs for a given try build? 1.15.2 How do I cancel existing jobs? The try server is an easy way to test a patch without actually checking the patch into the core repository. Your code will go through the same tests as a mozilla-central push, and you'll be able to download builds if you wish. After you have level 1 commit access, you'll need to do a bit of setup before you'll be able to push. See this guide for instructions. Note: Never pull the whole try repo. You'll end up with hundreds of heads containing everyone's half baked and broken pushes. For more information, see mercurial for mozillians. There are a few ways to schedule jobs on try. See this documentation for more information on all the available selectors. Once the push succeeds, you can open it in Treeherder and then sign in to schedule jobs manually. If it helps, you can use the filter box in the site header to restrict the list of runnable jobs being displayed. Click the job symbols you wish to schedule. Finally, click "Trigger New Jobs" near the top right of your push. NOTE: An action task gets scheduled which will schedule all the tasks you chose. $ hg commit -m "try: -b o -p linux64 -u mochitest"
Using |mach try| is recommended as that will automatically create and cleanup a temporary commit no your behalf, whereas with this method you are responsible for cleaning up any extra commits you make or commit messages you modify. The link to treeherder will be printed on the command line. Look for your changeset on Treeherder. You can add &author=YOUR.EMAIL to only see your pushes. Download your completed builds from firefox/tryserver-builds on ftp.m.o. 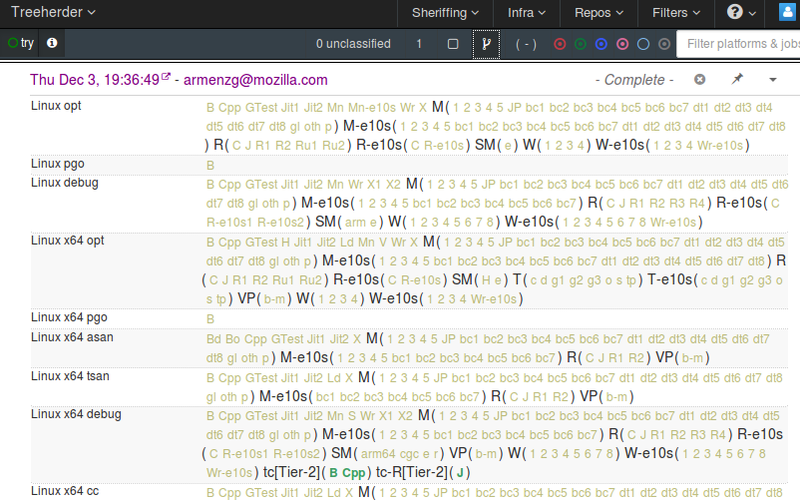 The mozconfigs for recent mozilla-central clones are located in the browser/config/mozconfigs directory. Edit those as you please. If you want to apply the same mozconfig changes to multiple platforms, you can edit build/mozconfig.common.override instead. This file is included at the end of each of the in-tree mozconfig files. Android mozconfigs are in mobile/android/config/mozconfigs. If you modify a mozconfig file named nightly, please make sure you also change any mozconfig file named beta and/or release in the same directory, otherwise the test_compare_mozconfigs test will fail. TryServer purpose is to tell what will happen on Tinderbox, not to check every possible build option/configuration. Any non-standard feature is implicitly unsupported. You may try them, but don't complain if they break. By default native debug symbols are not uploaded for Try server builds because of their size. If you want to debug your builds locally you must add MOZ_CRASHREPORTER_UPLOAD_FULL_SYMBOLS=1 to the in-tree mozconfigs. You can do this for all platforms by importing this patch into your mq and pushing it along with your changes to Try. This will cause a ...crashreporter-symbols-full.zip package to be uploaded to the builds directory for each platform built. It's possible to create new jobs (or modify existing ones) directly *in* your try push, provided you use taskcluster. Just edit the relevant configuration in testing/taskcluster. For more information on creating jobs, see the taskcluster docs. You can use the steps in Scheduling jobs with Treeherder to add localized desktop builds to your try push, regardless of whether you used try syntax at first. Filtering with 'l10n' helps to find the jobs amongst the many possibilities. The resulting builds are uploaded to the same sub-directory as en-US builds, eg try-linux/ for 32bit linux. You can also use the steps in Scheduling jobs with Treeherder to add localized desktop builds to your try push, regardless of whether you used try syntax at first. Filtering with 'l10n' helps to find the jobs amongst the many possibilities. reducing the number of locales by limiting browser/locales/all-locales (eg top-locales like de fr ja ja-JP-mac ru zh-TW). The resulting builds are uploaded as a task artifact, and are not yet signed. To get Android l10n jobs on taskcluster on try, simply pass `-p android-api-15-l10n` with your try push. You'll also get these jobs automatically with `-p android-api-15` if you are touching one of the files known to be heavily involved in l10n jobs. reducing the number of locales by limiting mobile/android/locales/all-locales (eg top-locales like de fr ru zh-TW). Treeherder data is purged after 4 months. ssh hg.mozilla.org, response: "No Interactive shells allowed here!" ssh hg.mozilla.org clone invalid_sandbox, response: menu display and interactive prompting. If you're experiencing excessive wait times (> 45min) pushing to try, please file a bug asking IT to reset the try repository using this template (please include specifics of your experience). They will coordinate with sheriffs and release engineering as needed. It means several developers are trying to push to try at the same time. In the case above, nothing appears to be wrong, as the PID changes between the messages. Similar to the above case, but with the same pid when you retry over and over again. Please retry your push. If you see messages indicating the same process has been pushing for more than 15 minutes, treat as above. How do I trigger additional talos/test runs for a given try build? If your trychooser syntax included the tests you'd like more of, then select the job you want on Treeherder and use the + button. For test suites you didn't request originally you can use the "Add New Jobs" interface in Treeherder. How do I cancel existing jobs? For individual jobs, select the relevant one on Treeherder and use the cancel button. To cancel all jobs, use the menu arrow shown on the header row for each push, and then the "Cancel all" option. See the TryChooser wiki page. This page was last modified on 4 April 2019, at 13:48.